In the olden days, when you saw something interesting on the Internet, you either dragged it into a folder on your hard disk or you saved a link in your browser. Usually, you wound up with a tangle of poorly labeled, oft-defunct bookmarks and a mess of mystery files on your drive. That was then. Founded by the startup Cold Brew Labs in 2010, Pinterest is currently (in late 2013) the fastest-growing social network, driving more business-generating web traffic than Facebook, Twitter, and Google+ combined. The platform’s social model for collecting, labeling, and transmitting pictures of stuff as viable hyperlinks is remarkable both as a content sharing community and as a clever platform for storing and categorizing images, videos, and links in the first place. For businesses, the angle is of course different, but the mechanics are the same. With a global user base that is mostly female (though notable local exceptions include the UK), the majority of pins in circulation are devoted to food, crafts, fashion, and home decorating. But don’t assume you’ll drown in a sea of casserole recipes and instructions for weird new ways to style hair: what you pin and what you see is really up to you, and just about everything has a following. For some users the most compelling reason for getting on Pinterest has less to do with community-based content sharing and more with the way organizing online and offline materials into a compendium of boards can streamline workflows, free up disk space, and render one’s curated content eminently accessible. For me, Pinterest has been a source of information and inspiration in many areas, but its greatest value derives from its utility for my branding and naming work. Not only do I have a flexible, accessible repository for all the noteworthy names, logos, brand identities, graphic layouts, and symbols I mine on the internet—I also have a system for storing and sharing dynamic archives tailored to individual projects. 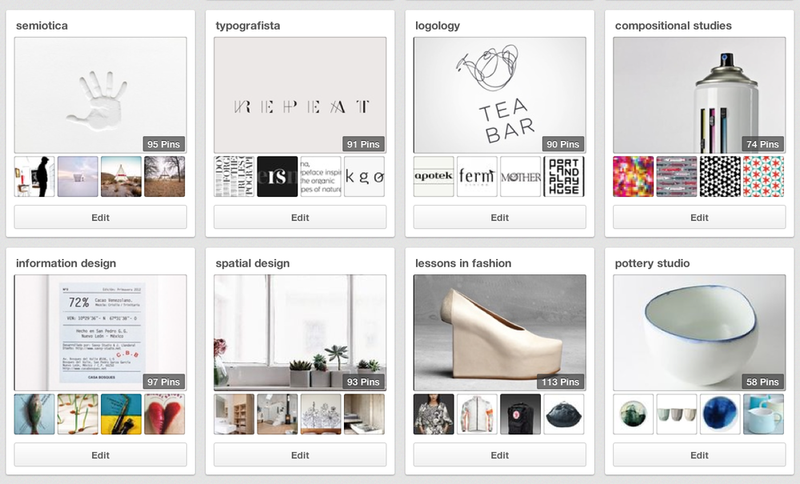 So whether you’re interested in driving engaged customers to your online shop or in carving out some space for your research materials, visual libraries, and wish lists—Pinterest is a tool worth exploring. Jest remember that before you get to the “useful tool” stage you’ll have to spend many an evening glued to your screen, telling yourself you’re “working” as you learn the lay of the land. A sampling of my boards as they appear to me when I’m logged in to Pinterest. Designed in 2011 by Juan Carlos Pagan and Michael Deal, the Pinterest logotype features a push-pin-inspired initial P and a lovely ligature finial.